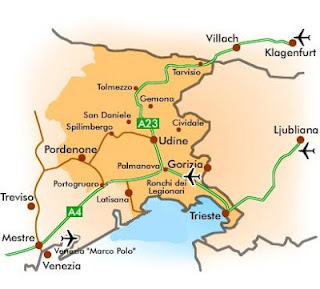 Firstly, don't worry, I hadn't heard of Gorizia either! So I shall fill in the gaps for you. Gorizia is a medium sized city in the North-East of Italy just two hours from Venice and slap bang on the border with Slovenia at the foot of the Julian Alps. Gorizia's Castle was built on a hill which overlooks the Slovenian twin town Nova Gorica ('New Gorizia') which developed when was the city was divided into two after the Second World War. The city of Gorizia is rather a mish mash, a mixture which comes from being on a border, especially one which, historically, has changed hands so many times. Therefore the city and its neighbour Nova Gorica are a melting pot of Latin, Slavic and Germanic influences. As the rickety train rattled through the countryside, the damage caused by the recent earthquakes in May (read more here) was visible as many old barns lay in ruins and several farmhouses were cordoned off. The area is safe to visit however as the major towns and cities were unaffected. We arrived at about 12.30pm. This was rather a miscalculation on our part and here I shall offer my first piece of advice to anyone wishing to come to Italy. If you are visiting a medium sized city or smaller, do be aware that everything closes in the afternoon, especially in the Summer when the sun is at it's hottest, from about 1pm and 4pm. Gorizia in fact, had many shops with notices up saying that they were closed for August ('siamo chiusi per le ferie') so do watch out for that when you plan your holiday. Larger cities on the tourist trail such as Venice, Florence, Rome or Milan have the same tradition but to a much lesser extent therefore you’ll always be able to find some shops open there. Unfortunately for us arriving in Gorizia at that time was that we found ourselves wandering through a ghost town. It was like a horror film where you slowly realise that the inhabitants are hiding from some malicious entity or that upon entering you became time locked and can’t escape (hm perhaps I’ve been watching too much of the series Once Upon a Time). Well, at least one thing became clear as we wandered through the streets: we were not locals. I slipped the ubiquituous camera back into my bag and whispered, ‘blend, blend!’ Our attempt failed however and curious eyes (peeping through slatted windows) continued to follow us through the empty sun-filled squares. We scrambed up the hill to the B&B much like the lizards scurrying away from us to seek shelter from the midday sun and we found ourselves on the doorstep of our B&B within the shade of the castle walls. After several ra-ta-tat-tats to the door we noticed that the place was as empty as the city itself. "The key's on the wondowsill. Just let yourself in," came the relaxed response from the landlord over the phone. So we pottered about the flower pots in search of the key, but not surprisingly, the key appeared to have gone awol. Once we were safely stowed away inside our room, we discovered a lovely terrace overlooking Gorizia. Directly below us was the garden of a convent. The hotel landlord informed us that they were special nuns as they were of an order which never left the convent. I that it was very strange and a bit sad (from my perspective) to be so cut off from the world. But when I peered over the wall into the gorgeous garden and saw a nun welding bits of metal together and another with a mask opening cans of some sort of flammable liquid, I realized that perhaps this sisters were not normal nuns and were actually living quite a daredevil life! Either that or they are part of a secret conspiracy to create Italian weaponry… hmm, either way, I wouldn’t want to mess with any of them! Much later, in the cool breeze of the evening, we strolled up the hill to the castle and had our first glimpse of Slovenia. Someone had jokingly told me beforehand that the best thing about Gorizia was the view of Nova Gorica. Much like Guy de Maupassant, the novelist best known for The Necklace, saying that the best part of Paris was at the top of the Eiffel tower because that was the only place where you couldn't see the tower itself! Joking aside, the view was actually spectacular at sunset and it made me curious to find the official border. On the trail of the border! We went from signpost to signpost searching for the official border. I'd have felt silly asking someone, 'where is Slovenia??' as they'd probably say I was already in it. At last we stumbled upon the limbo of the immigration office between the Italian and Slovenian border. I dashed under the bridge, hopped into Slovenia, took a photo, stole some foliage, and left as quickly as I'd entered. As Gorizia is relatively small, I'd recommend it as a day trip city. It's only two hours away from Venice and so it would provide a welcome break from the touristy hussle and bussle of the famous canal-filled city. Gorizia also provides an alternative peek into Italian life, as Venice (beautiful as it is) is atypical of the rest of Italy and really is a a world of its own. Thanks for reading. I hope you found the article interesting or found a useful tidbit amongst my musings. As always, let me know what you think or help me to correct any mistakes I may have made inadvertently. Hey nice one.!! Beautiful photos, @themaryfairy do visit this place.! !